Is It Time to Shoot Your Hero Shot? Home Ecommerce Platform Is It Time to Shoot Your Hero Shot? Hero shots. Those photos of products or shiny happy people that represent what you are selling. They’re everywhere, often occupying a large area on your home page inside a banner graphic. Most websites use them – and many abuse them. A banner graphic is only helpful if it effectively communicates the value proposition of your business or the product in question, and attracts attention to your primary call to action. While it’s worthwhile to A/B test to see whether you need a header graphic at all, the imagery you choose in your test will greatly impact your results. In fact, you should test header graphics against each other before testing with/without. 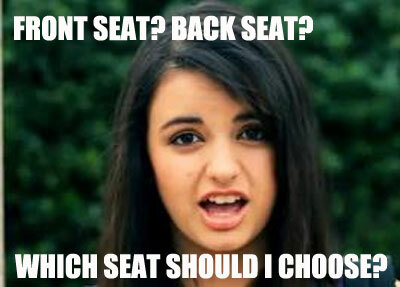 You knew I was going to say this, but I don’t mean just quantitative A/B testing. Test images with eye tracking to see where attention is landing. You may also want to use FiveSecondTest to gauge recall for tagline messaging after users view for 5 seconds. For A/B experiments, it’s important to drill down into your data and segment. For example, two universities tested hero shots, with opposing results. A closer look at the data revealed the university that had poor hero shot results was receiving most of its landing page’s traffic from other pages on its domain, while the school that rocked the hero shot received more first-time, search engine traffic. Not only does it violate design principles (rule of thirds), but it makes neither offer/message primary. This taxes the visitor’s cogs to figure out which message they should pay attention to. They are truly competing calls to action. Throwing two products into one hero shot without any context on what differentiates them is another mistake. Other than slightly different box artwork, what makes “Platinum” so much better than Nero 11? In the example above, “Make the most of your photos, music and videos” carries no meaning or persuasion. It does nothing to generate interest in the product. 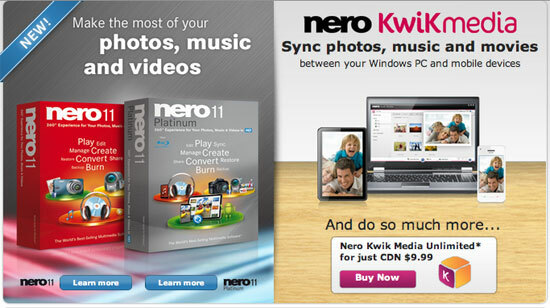 “Sync photos, music and moves between your Windows PC and mobile devices” spells out the benefit of Kwikmedia, and its hero/product shot visually reinforces this benefit. Ideally, the hero shot banner clearly communicates a strong, unique selling proposition that states why the potential customer look nowhere else for this type of product (or to upgrade from a previous version). This is not new information for you, but it keeps happening over and over on the web. Friends don’t let friends camouflage their calls to action. That doesn’t mean you can’t use bullet points at all, just responsibly. Research has proven our eyes follow a person in a photo’s gaze. We look where they look. Alternatively, use the model’s body to point to the most important content. I’m not a doctor but I play one in stock photography. When it comes to stock photos vs. your own photography, make sure the 15 year old model-slash-doctor and its counterparts do not harm the authenticity of your site. 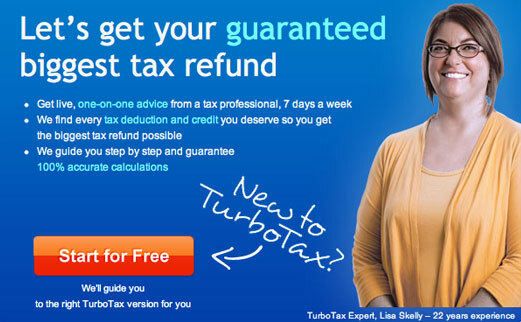 Turbotax’ real employee complements the service value prop in the headline and bullet text, and humanizes the site. The woman’s eyes don’t look toward the call to action, but the arrow may do the job just as well. Personally, I’m not against stock photography, as long as there’s continuity throughout your site. All images you use should look like they come from the same photographer. Also remember, images send powerful subconscious messages. What message does this hero shot for a CD burning software convey? Does it imply it helps you do illegal activity? Unless you’re target is black hat SEO, avoid photographic references to shady activity. A side note about calls to action: labeling, size and placement is important. Which of these is the primary call to action? Download or Buy? What is the difference between dowloading and purchasing? Is the download free? (It’s explained in the text area, but should be proximal to the calls to action). Not enough questions are answered by the hero shot space to help the user decide. (And the world map has absolutely nothing to do with anything). Gender does have a psychological impact on advertising, the question is how does it impact your advertising? Consider testing hero vs. heroine. A study from McMaster University on the priming effects of images found pictures of attractive women caused men to favor short-term rewards, while there was no effect on women viewing photos of attractive men. The theory is explained that the photos trigger in men short-term thinking (making babies), while women skew towards long-term planning (similar to raising babies). Roger Dooley, author of Brainfluence (excellent book) suggests using photos of attractive women may have a negative effect on products like life insurance and annuities that stretch payments and payback into the future, by causing men to prefer cash in their hand today. Payday loan and casino ads, on the other hand, would benefit handsomely from hermosa heroines. Another example from Brainfluence: a South African bank mailed 50,000 customers bank loan offers that tested a variety of “irrelevant offer changes” to frame customer behavior, like comparison to competitor products and pictures of men and women. Offers ranged from 3.25% to 11.75% interest rate. Surprisingly, the female photo had the same impact on response rate as a 4.5% drop in interest rate — for men, women were unaffected. “Friendly faces and culturally appropriate colors” can also impact your conversion, according to a study by Simon Fraser University. It’s worth testing expressions…for both genders. Choosing a hero shot based on gut feel may be shooting yourself in the foot. But your header graphic is more than a photo, make sure text and calls to action work in tandem with your headers to give you the most bang for your banner.